1 of 4 Heat oven to 350 degrees F. Spread bread cubes onto two large baking sheets. Toast at 350 degrees for 15 minutes and transfer to a large bowl. 2 of 4 Heat a large nonstick skillet over medium-high heat. Crumble sausage into pan, breaking apart with a spoon. Cook until no longer pink, 5 minutes. 3 of 4 Stir in apple, onion, carrot, celery and garlic. Reduce heat to medium and cook 5 minutes, stirring occasionally. Add broth, sage, thyme, rosemary, salt and pepper. Heat through, about 3 minutes. Pour over bread cubes and stir gently to moisten. 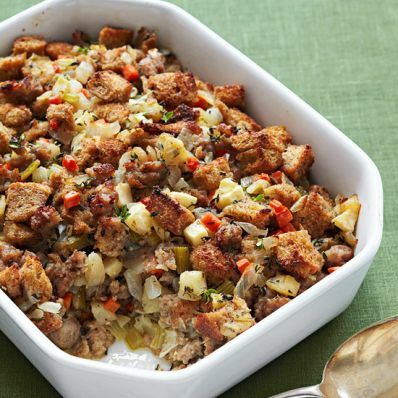 4 of 4 Loosely pack stuffing into turkey before roasting, placing excess in a small covered dish. Or spoon all stuffing into a 13 x 9 x 2-inch baking dish. Cover with foil and bake 20 minutes, uncovering for last 5 minutes to crisp top, if desired.